Unfortunately I didn’t prepare to take many photos with my ixus as it was supposed to be a birthday lunch, not a photography session. The complimentary bread came just a little warm, with two small saucers of salmon rillette and butter. I love the pairing of the raisin bread slice and salmon rillette. The sweet raisins complimented the fishy salmon really well. Kudos to the service staff who promptly offered to refill our bread straight from the copper pan they were warming up the bread in as soon as we were finished! We got an amuse bouche of potato croquette, cream soup and toasted broiche. Apologies but my memory fails me (again!!) of the exact name. But the croquette was bursting with flavour, well fried crunchy goodness with creamy mashed potato innards. But the broiche was horrible. it was literally dripping with butter and was served cold. Thankfully, that was the only major downfall of the meal. For starters I had millefeuille saint jacques. 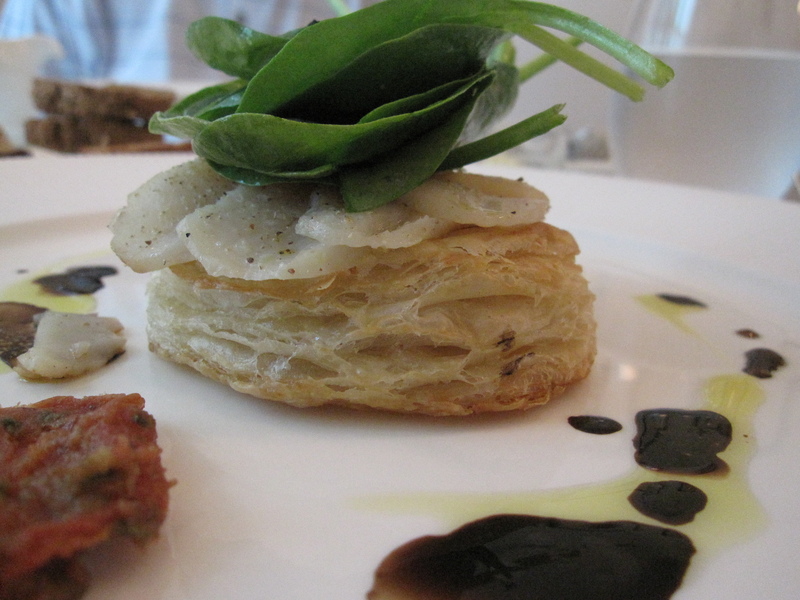 Though the puff pastry was tough, I liked the scallops on top and the bayonne ham leaves. After munching (and tearing it with my knife. goodness! i never knew puff pastry could be so tough) for awhile i started to appreciate the french butter brushed between each layer. French butter is so much more fragrant than normal butter. I hate the smell of butter in general but french butter is in a different league all together. I don’t take shrimp, so I didn’t opt for the highly raved lobester bisque. Dad simply adored this dish. He complimented it saying this was the best lobester bisque he ever had. I had a sip and immediately I understood why. 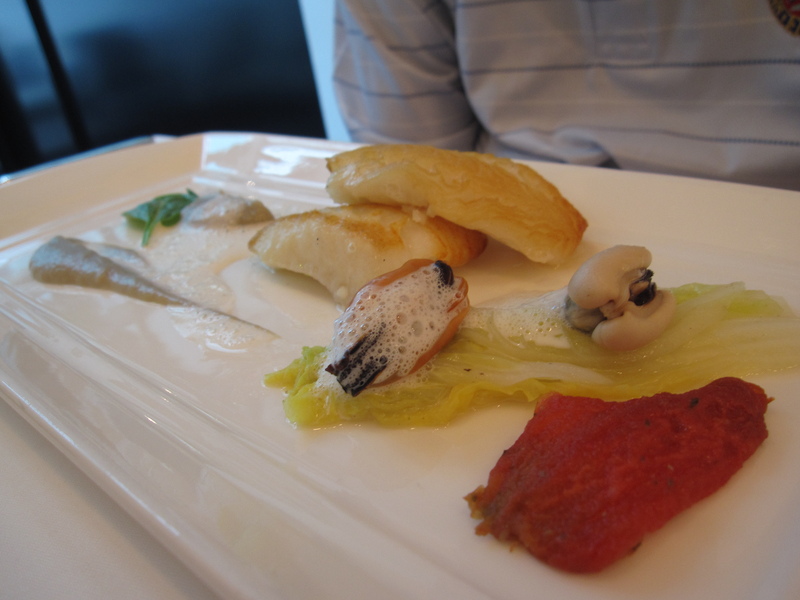 It had a full bodied creamy flavour accented with the essence of the lobster. 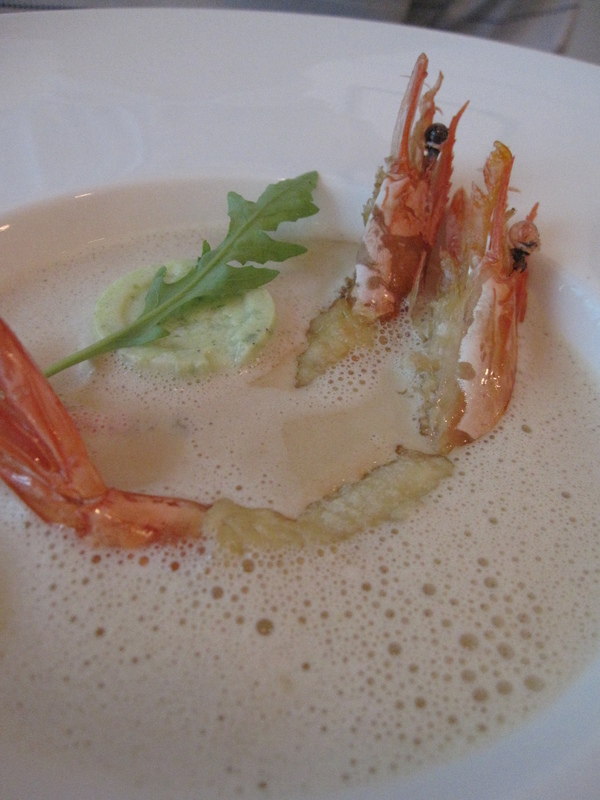 I remember reading about how to make lobster bisque in another one of my fav blogs, la tartine gourmande. It’s a really tough process of simmering (or boiling?) the lobster within and leaving it to rest overnight to infuse all the flavours of the lobster into the soup! 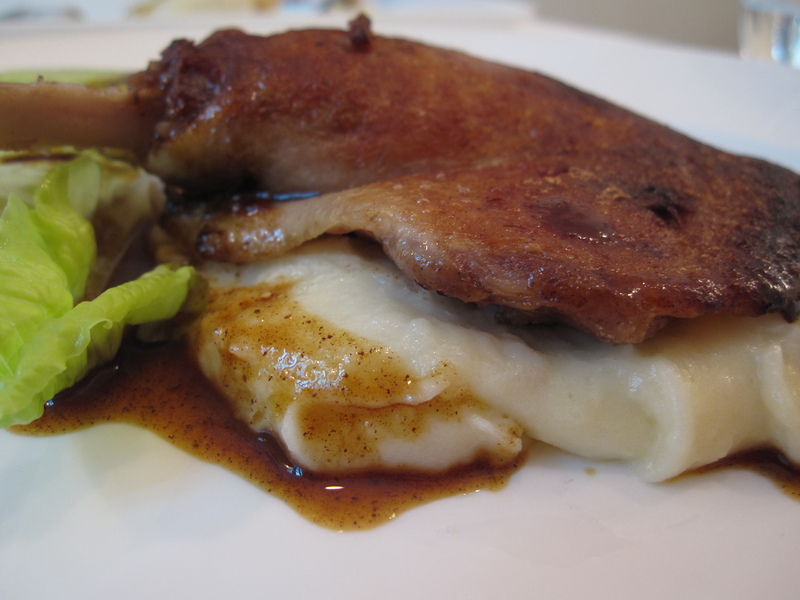 The confit de canard was undisputably the best dish of the meal for me. I rarely find my mains more impressive than my dessert so this says a lot! nothing went wrong with this dish. The meat was firm and tasty, neither tough nor too soft (when it’s too soft they probably used meat tenderizer. I hate it because I start to question if i am eating meat in the first place. for example the teriyaki chicken that subway uses. Are they really using chicken??). For those who like things fried, you’ll love the crispy skin that the duck has. And I really hate potatoes, especially mashed potatoes, but truffled mashed potato really ups the ante. The woody notes from the truffle uplifted the flavour of the smooth mashed potatoes. Dad was busy stealing my mashed potatoes and waiting for me to give him some duck occasionally 😛 Obviously, my mains trumped his! Both of us chose the champagne sabayon with forest berries ice cream. Not exactly mindblowing, would have loved more ice cream, but nonetheless an acceptable finish to our wonderful meal. 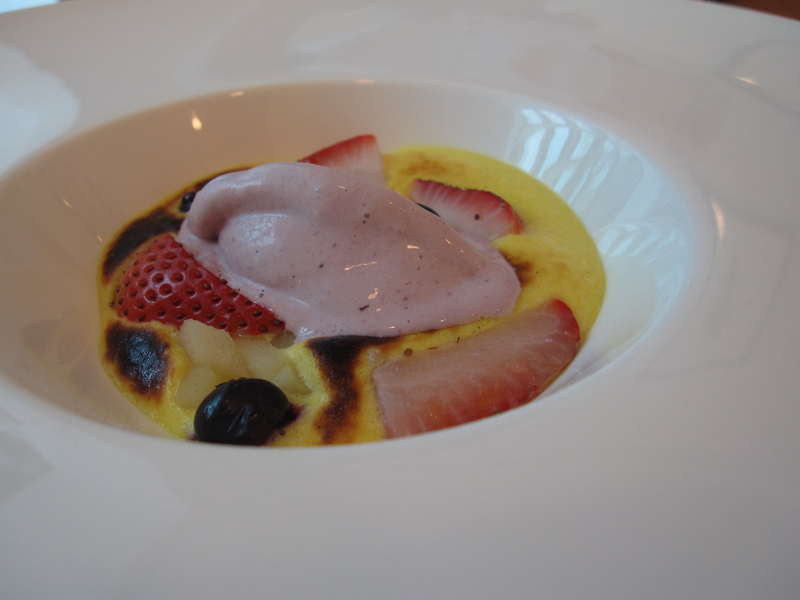 Sabayon is really egg whipped with a type of liquid ( in our case champagne) over bain-marie. Pretty interesting, but i would rather eat my souffle/ macarons any day over this. Dad promised that we’ll be back, and the next time on ala-carte. But he’s paying of course, haha.